This week we continue with the five hindrances. The five hindrances are common mental states that arise in our practice and lives that can impede our practice. They have been observed and taught as part of Buddhist studies. This week we are focusing on the third aversion, sleepiness or dullness or sluggishness. Our lives are so busy. Often times the moment we slow down for our yoga and meditation practices we realize just how tired we are and how much fatigue we are carrying. 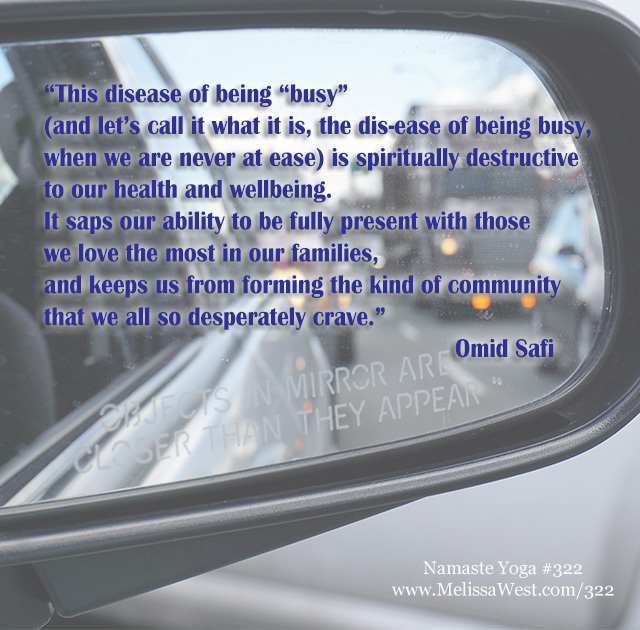 When we slow down and come to our yoga mats we are saying no to the disease of busy-ness and the result can often be that neutral experiences can seem dull and boring and even put us to sleep. If we are not mindful we can be off looking for the next experience to entertain and occupy us. Our North American culture is obsessed with doing and definitely does not celebrate being. One of the most common complaints I hear about my yoga classes is that they are too slow and boring. I often feel this complaint comes within a cultural context of depending on the intensity of doing to feel alive. When our experience is neutral we are trained to look for something, anything to do, or to numb out and go to sleep. In our yoga practice we are training in mindfulness, that is we are training our attention. When we begin to numb out because our experience has become boring for us, we are experiencing the aversion of dullness or sleepiness. This can be our meditation bell to remind us to come back to our training in attention. 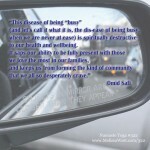 We can bring our awareness and interest to our breath and our sensations in our body. Even if our practice is calming, we can train ourselves to pay attention to what is happening. We can challenge ourselves to not numb out when the experience is “dull.” This is the practice. Today’s question to answer in the comments is: How do you let go of the tyranny of busy-ness? If you would like a list of the antidotes to the five hindrances put your email address in the box below and I will send you a PDF list of the 5 hindrances and their antidotes. If you would like more restorative yoga classes, I highly recommend our membership community. We have several restorative yoga classes in our community. I have included a playlist to several restorative yoga classes.